Weir Minerals' new facility in Leszno, Poland. Weir Minerals Europe has expanded its operations in Poland, with the opening of a new facility in Leszno. The new centre is three times the size of the existing facility and includes increased office space, a specialist training area and two overhead cranes – one 20m high. A number of jobs have been created as a result of the expansion and the growing installed base of Trio products. 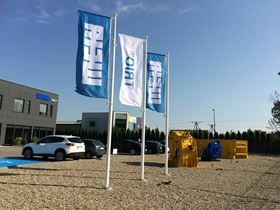 The Leszno facility is set to become one of Weir’s key facilities for Trio products in Europe, holding a large inventory of products and spare parts. The new centre will play an important role in helping the local team in Poland to manage its growing customer base and increasing demand for replacement parts. With the increased space, the Weir Minerals team will also be able to offer on-site manufacturing services including fitting screen decks, changing crusher liners and some equipment assembly. Part of the new premises will focus on aftersales care. The Weir Minerals maintenance team will train customers’ service personnel and engineers in key areas such as equipment maintenance, and in how to spot the signs that repairs may be required. 2016 marks the 125th year of business for Weir Minerals’ Lewis pumps brand.